With his first mate and crew, amateur sailor Larry Jacobson embarked on a lifelong goal to circumnavigate the globe. The namesake boy behind the gate is a passionate romantic who, since childhood, yearned to discover what’s out there…. How do some people overcome fears and insecurities to manifest their dreams? What are the characteristics that allow them to completely transform their lives from one of stability to one of uncertainty and adventure? Don’t we all entertain ideas of reinventing ourselves, of having a chance to do it differently and by our own rules? Willing to risk all, Jacobson spent six years sailing into the unknown where the unrelenting oceans served as a teacher of seamanship, personal strength, and perseverance. In The Boy Behind the Gate, the author reveals those crucial steps that will motivate you to make your dreams come true. We are each given one great opportunity at life. What are you going to do with yours? In the late summer afternoons, I would ride over to the marina where the big boats were docked. The gangways were always locked. I stood behind the gate staring at the yachts, imagining what it would be like to stand at the wheel, to back out of the slip, head up the channel, turn south, and keep going. Even then I didn’t want to be the boy behind the gate. I wanted to be the one at the helm calling, “Cast off the bow, we’re headed to sea.” Thirty years later it dawned on me: we were docked right where I used to stand behind the locked gates looking at the big boats. Only there was one difference—the boy behind the gate—was now standing at the helm. A riveting tale of determination, overcoming challenges and, ultimately, finding inner joy. A must-read for anyone who wants to be inspired to live their dreams. You won't be able to put it down. What a delightful read. 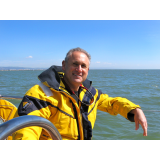 Larry Jacobson's lively prose and vivid descriptions manage to convey not only his sailing story and the amazing adventures of his circumnavigation but also lets us into his heart in a way that few writers achieve. The account of his inner journey, while he learned to overcome his doubts and achieve "life lived to the fullest," is truly inspiring. Even if I had never sailed on a boat in my life, I would still have found it difficult to put down this charming memoir.